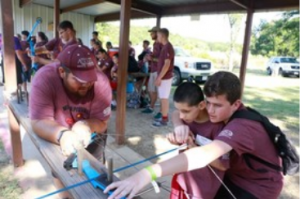 Mission Possible is a co-educational, inclusive program that provides a residential summer camp experience for youth of differing abilities, bringing youth together to improve their abilities and to learn from each other. The three primary objectives are to include youth with medically-diagnosed disabilities in a traditional summer camp environment, educate 4-H members about disabilities, and prepare 4-H members to advocate for the disabled community. The program began in 2004 with funding from National 4-H Council’s Building Community Inclusion initiative aimed at providing an inclusive 4-H experience. In total, 538 youth have participated in the 13 camps; 238 youth with medically diagnosed disabilities and 300 4-H members serving as mentors. Mission Possible wins on two levels: campers have fun, just like any other youth, and 4-H youth who serve as mentors gain valuable interpersonal skills. “These experiences have taught me to be a different kind of leader. I also learned that though people with special needs are often viewed as ‘disabled,’ their only real disability is a lack of acceptance.” – 4-H mentor.